Celltone Skin Care, known for its range of innovative beauty products based around the snail gel extract, had a treat for women this month. Celltone took their pop-up spa experience and headed to three different corporate companies during August – giving over 620 ladies the “Be Good To Your Skin” experience. 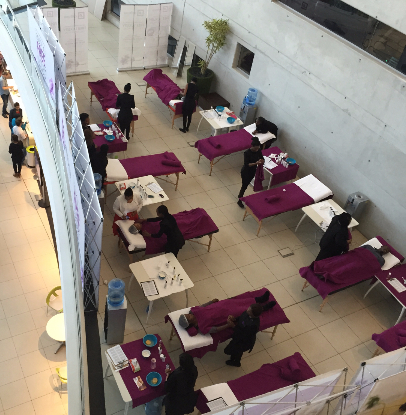 The women were given the opportunity to experience a luxury facial or hand massage by Celltone beauty therapists. Reminding them that every day with Celltone is a pamper day. Many of the ladies had never experienced a facial before and those who had hadn’t treated themselves in a while – the experience was incredibly well received. The Celltone pop-up spas are designed to pamper and rejuvenate all who pass through its doors. The Celltone team have been busy during August – running additional pop-up spa experiences in the leading malls within Gauteng: Sandton City, Eastgate and Southgate. Celltone also sponsored hundreds of women who attended women’s day events at prestigious institutions with a bottle of their signature Tissue Oil, which has been clinically proven to deliver 5 times more hydration and is the only Tissue Oil to contain 7 essential oils and snail gel. Celltone also had a lucky draw hamper valued at R1500 for one lucky winner present. The range of products offer high quality ingredients, clinically proven to care and improve the skin. The range is currently available in a variety of well-known retailers like Dis-Chem, Clicks, and Game.